Based in Safford, Arizona, the Large Binocular Telescope Observatory (LBTO) seeks candidates for the position of Staff Technician. 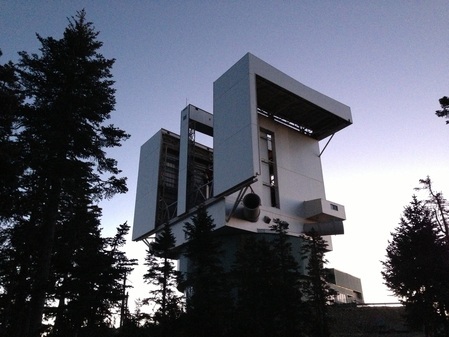 The Large Binocular Telescope represents a major advance in astronomical research capabilities. Currently operating every night of the year possible, the LBT, located on Mt Graham near Safford, Arizona, is the largest optical/infrared telescope in the world. The selected candidate will report to the LBT Observatory Manager or designate at the telescope and will work on a variety of complex equipment, perform routine maintenance, repair, and installation work. The candidate will work a varying shift schedule at the telescope on Mt Graham. Candidates must be able to perform his/her duties at an altitude of 10,500 feet and travel up and down the mountain each day in a car pool from base camp. The selected candidate will participate in the integration, acceptance testing and operation of the LBT and its various subsystems. The position requires the ability to work in a team environment, and to handle assignments independently. Computer literacy for electronic documentation retrieval and modification is required. A well-organized and structured working attitude is required. The ideal candidate will have previous experience in the plant maintenance and electrical areas. This position's schedule will be comprised of four days with 10 hour shifts. Installation, troubleshooting, repair, and maintenance of various electrical and electronic systems and complex electro-mechanical systems. Assist in all maintenance of observatory systems (electrical, mechanical, optical, pneumatic, fluid systems). Understand and interpret electrical and mechanical drawings. Update documentation using AutoCAD and word processors or by hand. Help maintain telescope and instrument spare parts. Work safely around large and small optics. Must possess a valid driver’s license with an excellent safety and driving record and at least two years of driving experience. Ability to work in a team environment and to handle assignments independently. Computer literacy for electronic documentation retrieval, modification, and communication. Ability to lift and carry objects weighing 50 pounds as needed. Ability to use general and specific use hand tools and electrical test equipment. Completion of a two year technical vocational or college program in the field of expertise with emphasis on math, science, engineering or technology AND six years of broadly diversified experience in a variety of positions involved with complex applied technology such as science projects, aerospace, nuclear power or sophisticated instruments (including two years of experience in the repair, fabrication and maintenance of electrical and mechanical systems); OR, eight years of broadly diversified experience in a variety of positions involved with complex applied technology such as science projects, aerospace, nuclear power or sophisticated instruments (including two years of experience in the repair, fabrication and maintenance of electrical and mechanical systems); OR, any equivalent combination of experience, training and/or education. Previous experience with telescopes or other precision electro-optical-mechanical systems. Maintenance experience with complex systems. Trained in any or all of the following areas: boom and scissor lift operation, forklift operation, proper use of PPE, fall arrest, first aid / CPR /AED, crane operation, rigging, ladder safety, lockout/tag out, and arc flash.